I am replaying a post today that I ran for Memorial Day back in 2010 that featured the living photographs of Arthur Mole. I have added a few more images to the original post. Enjoy and have a good Memorial Day. 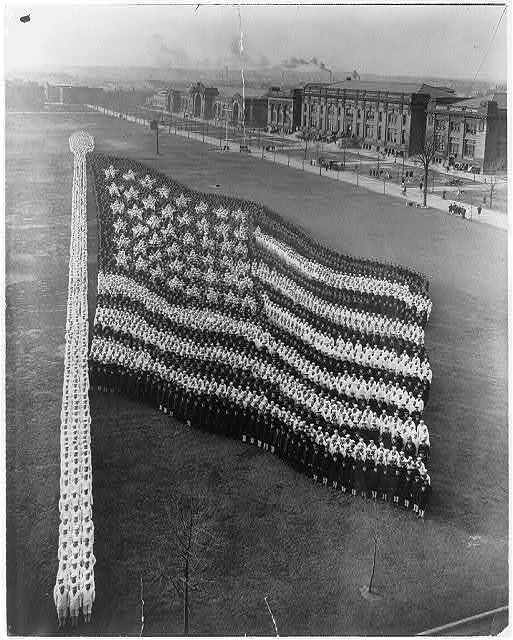 On this Memorial Day, I thought I would show some patriotic images photographed in the first part of the 20th century by Arthur Mole. 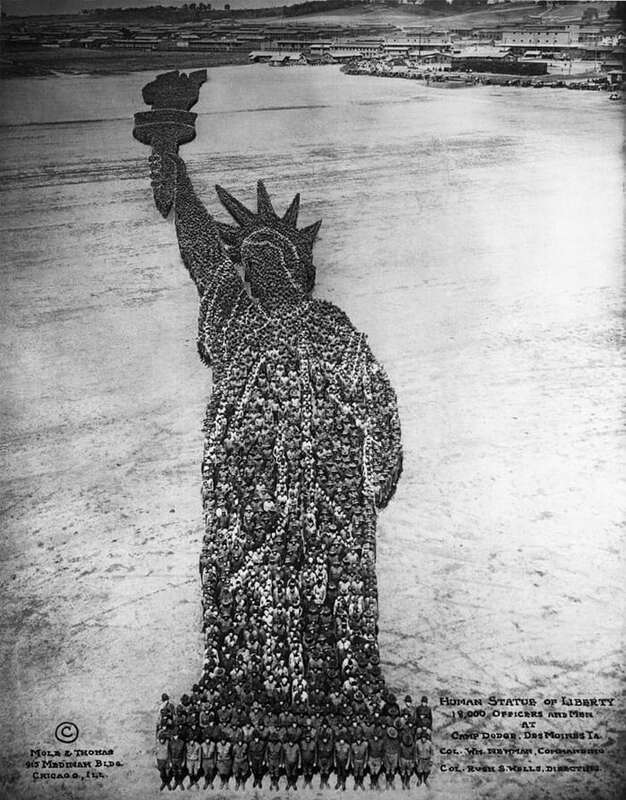 Mole made a name for himself at the time by assembling large groups of people in formations and photographing them from a specially constructed 80-foot tower. He started at church conventions and later did the same for a number of universities but was probably best known for his symbols of the US and its military. 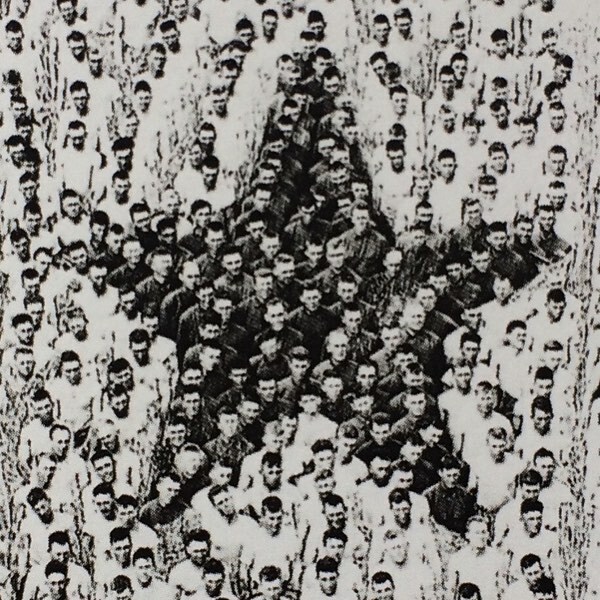 Needing large groups for his intricate compositions, military bases seemed like the perfect place to find massed groups of people to use as the paints on his palette. 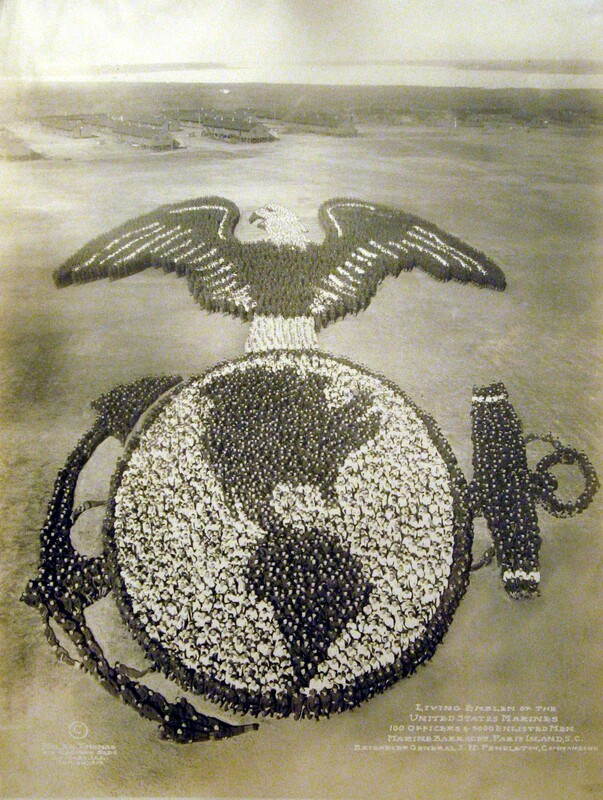 For instance, the Marine Corps insignia shown here was shot at Paris Island and took 100 officers and 5000 troops in order to fill out all the details in the composition. It took quite a few more people to fill out the upper details in his compositions in order to maintain perspective from the perch where he shot as these areas were considerably larger in size than the than those nearer the camera. 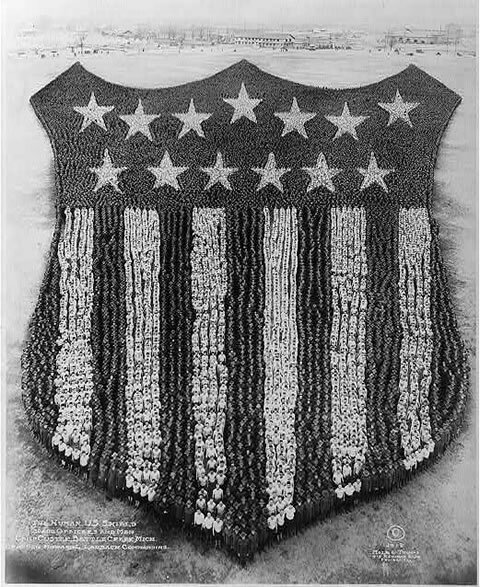 Take this US Shield shot in Battle Creek, Michigan as an example. 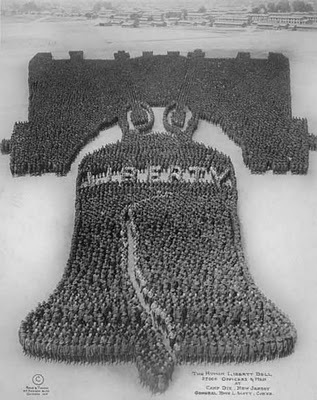 It took 30,000 troops to complete this but the bulk of these troops were used in the area above the first row of stars. The varying shades were achieved by having the troops wear different clothes, obviously. For the light areas, they simply wore t-shirts and for the dark areas they wore their uniforms. In the shield photo, those in the dark areas also wore their hats to make the tone more uniform on film. No shining faces breaking up the dark shades. These are pretty amazing photos when you consider that they were taken in world long before Photoshop or any type of computer generation. It must have taken a tremendous amount of planning and effort to pull off these shoots, from the building of the tower to the precise placement of each soldier. For that alone they deserve a tip of the hat. And on this Memorial Day, the sight of troops who sacrificed in some way for our country standing side-by-side to create the symbols that embody our nation is a fine way to remember them outside of the battles they fought and the great sacrifices they made.